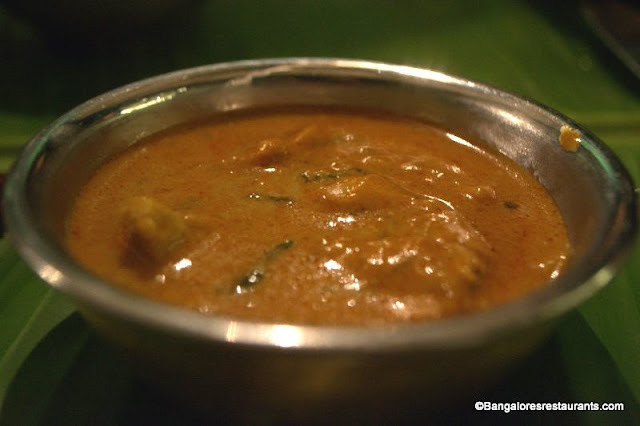 I am from the coastal regions - Mangalore, being home, for us fish is a staple at lunch. Some version of it is always on the table and so integral is it to our eating habits that we tend to take the best of fish for granted there. Its only when you move away from home do you realize truly what terms like "fresh fish", "meaty crabs" and "straight from the sea" really mean. 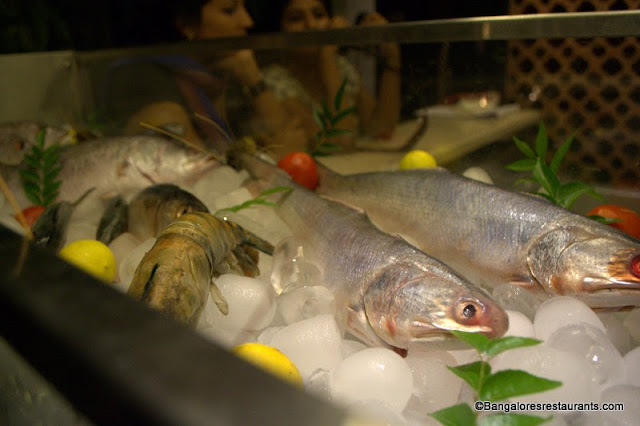 We were recently invited to a bloggers table at the Karavalli - The Gateway Hotel on Residency Road. 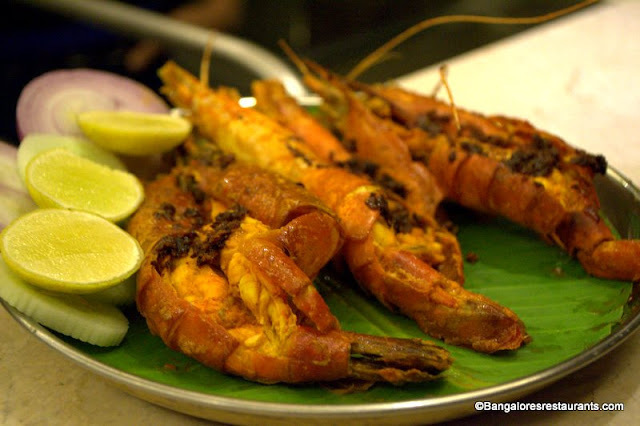 The whole concept, thought up by the inimitable Chef Naren Thimmaiah is a host of seafood, meat, poultry and vegetarian dishes that make up the quintessential Konkan coastline and a bit of Malvani cuisine as well. The focus for this particular meal was on seafood, which we, and even guests coming into the restaurant will be able to choose themselves. A range of marinades representative of various regions will be on display. You can choose from these and grill your food yourself under supervision or have the chef whip it up for you. It was a beautiful evening to experience such a concept. A great set of friends at the table only enhanced it further. More of a picto-review going forward. We call this the Tondor in Konkani, which is basically a steamer and I have one in aluminium at home. It really reminded me of grandma's place though. 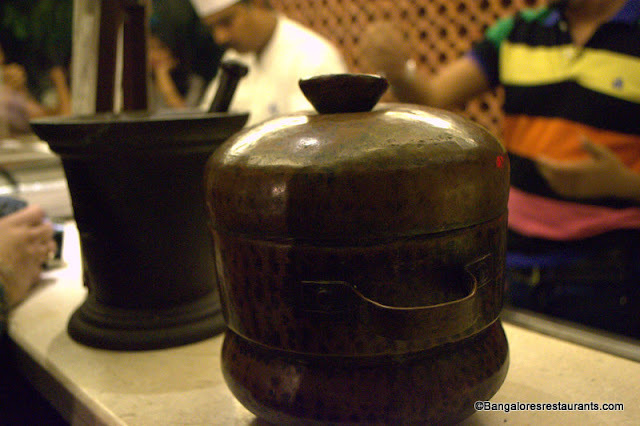 The same with the mortar and pestle at the back. 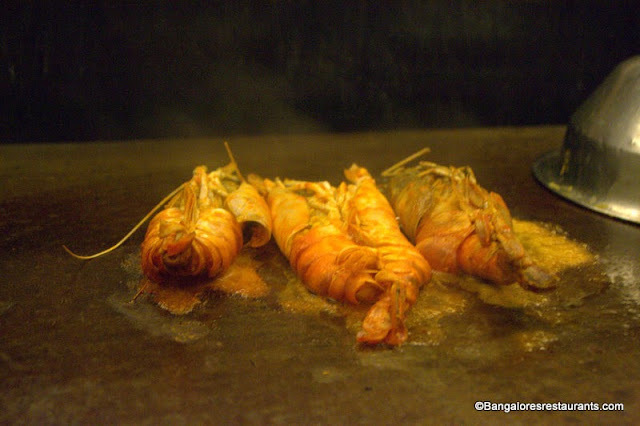 I wanted to grill the scampi - I chose to go with a Goan masala that evening. The shell of the scampi was retained and it was rubbed down with salt and lime juice first. It was then generously coated with the red masala and placed on the hot grill and covered with the vessel you see in the corner. This allowed it to cook well. The scampi, once done and plated by the chef - We were still busy with our photos and got to the scampi in a little while. They were meaty fellows and did full justice to the masala they were cooked in. A couple of rounds more did come through the evening and we never hesitated in accepting another helping. 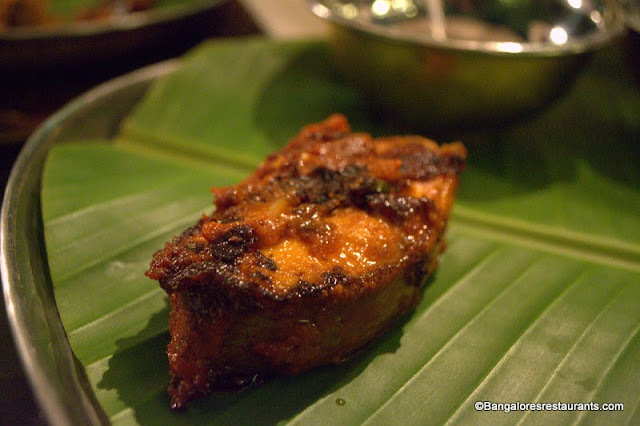 The Meen Eleittad which was cooked inside a banana leaf. 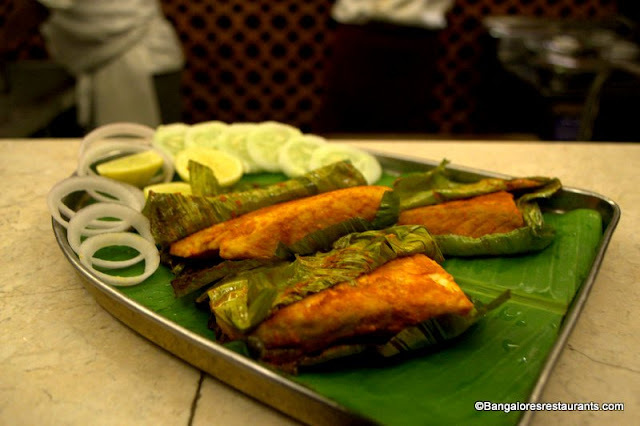 The leaf ensured that while the fish cooked, the juiciness of the fish was retained and the masalas has seeped through. 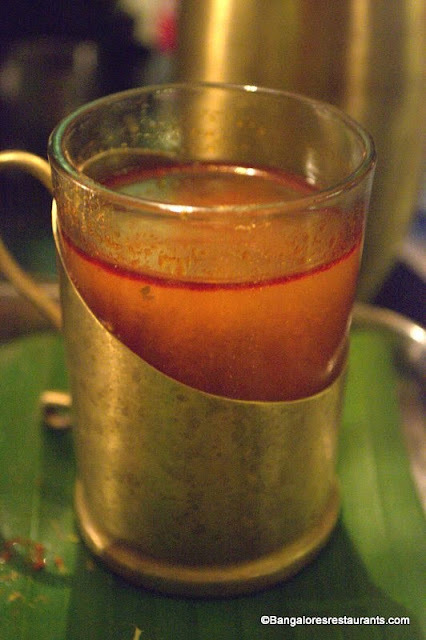 In fact a bit of all that marinated goodness collects on the banana leaf and this should not be missed. Kaju Kothambir Vadi - Coriander tossed masala cashews - safe to say that no one can stop at one - plateful that is! 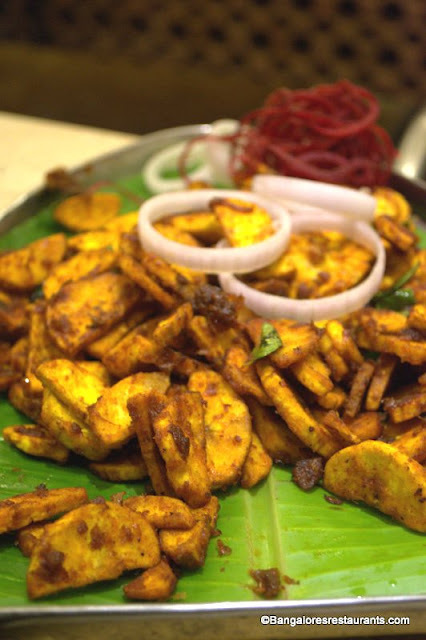 Pachakkai Varathathu - the classic raw banana, kerala styled - a nice crisp bite at first, giving way to that slightly fibrous inside that all raw banana lovers will appreciate. There was also the Oggraneda Aritha Pundi - rice dumpling flavored with coconut and jeera and tempered with mustard and curry powder - something my little one loved the most. 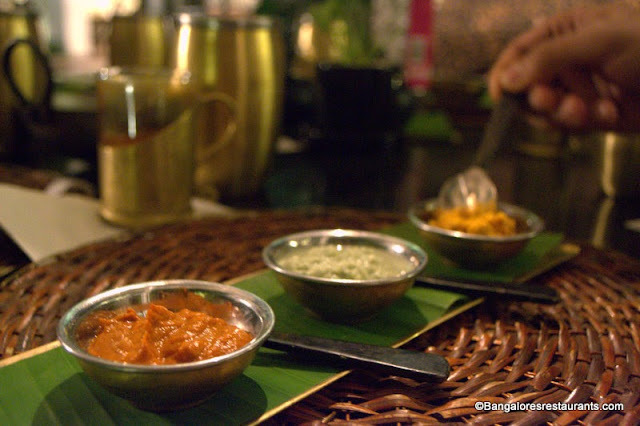 The arrival of these chutneys - mango, coconut and tomato signaled the beginning of main courses for dinner. Yes! there was a lot more to come apparently. 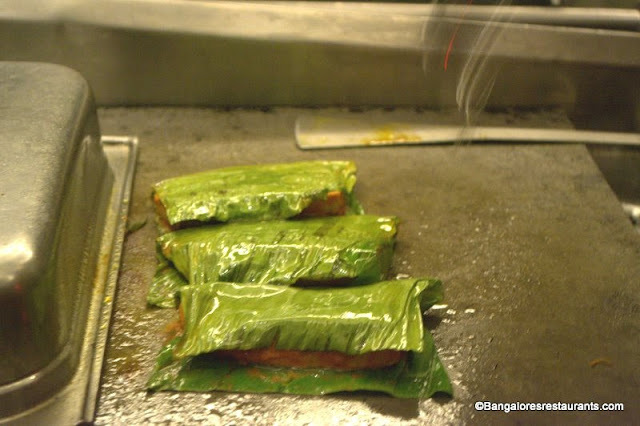 Steel thalis lined with a banana leaf were set out with little katories and the feasting soon began. One point to note here is that each of the gravies served were cooked on wood fire and had a uniquely different taste. One thing I am guilty of despite having grown up with fish on my plate everyday is not being able to recognize one from the other. This was a really tasty fried version, on the spicier side. 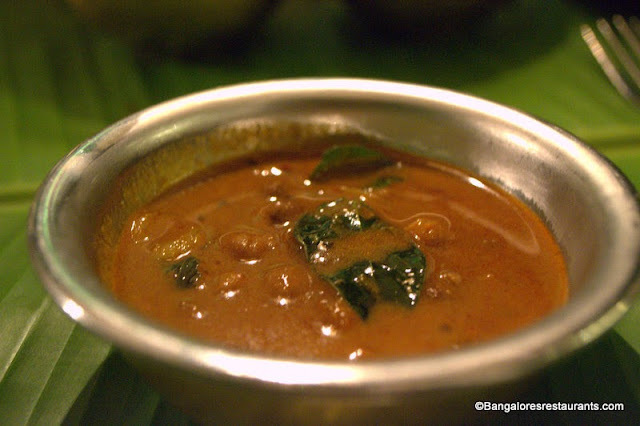 The kadala gassi - a typically South Canara preparation of brown chickpeas in a coconut gravy. A very home made feel to it. The one that I loved - Meen Vevichathu - Seer fish in a chilli based gravy - it was tangy (kokum or tamarind am not sure), slightly thick but brilliant. 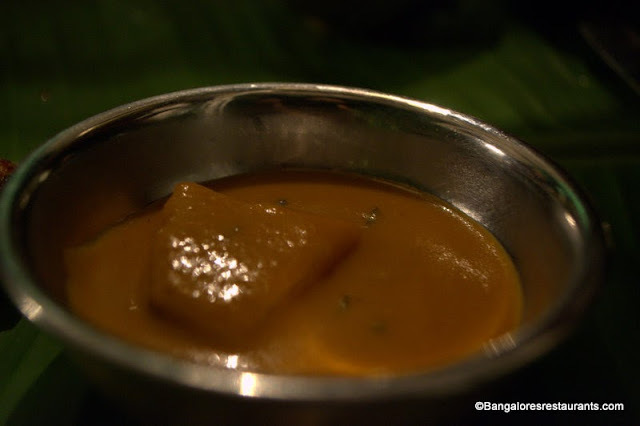 Maavinakkai Mensukkai - a specialty of the Havyaka community - a preserved mango curry. Am not a fan of fruits in gravies, so this one did not work for me, but the others seemed to like it a lot. The accompaniments were boiled rice, malabar parathas, idiappam with a dash of grated coconut at the center of every mound and appams. 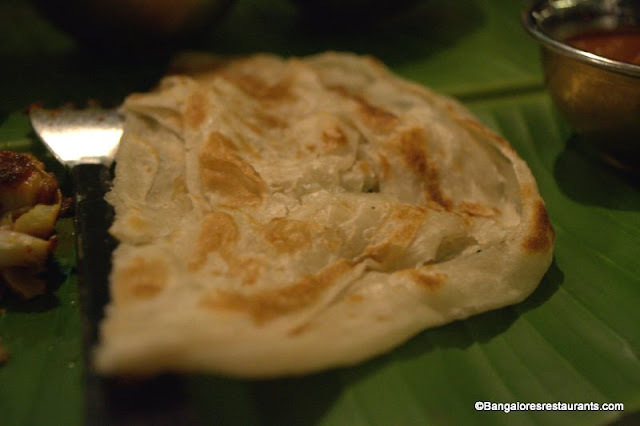 One grouse I have with most places claiming to serve appams is that they never get the crisp outer edge with the thick mound in the center. Most places turn out thicker neer dosas at best. 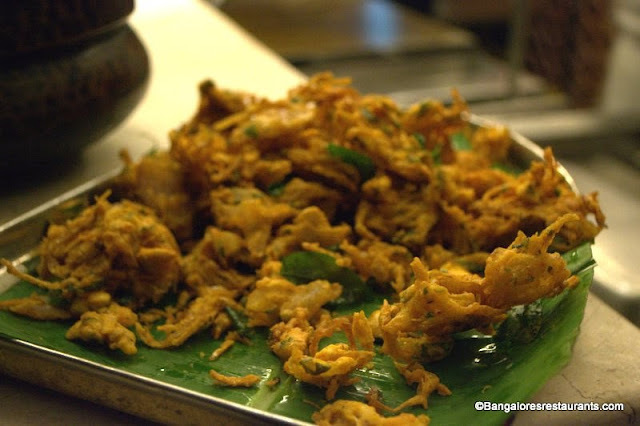 The appams here at Karavalli are fermented with congi (rice water) that is kept a few days, has a brilliantly soft touch to it and perfectly turned out crispy edges. 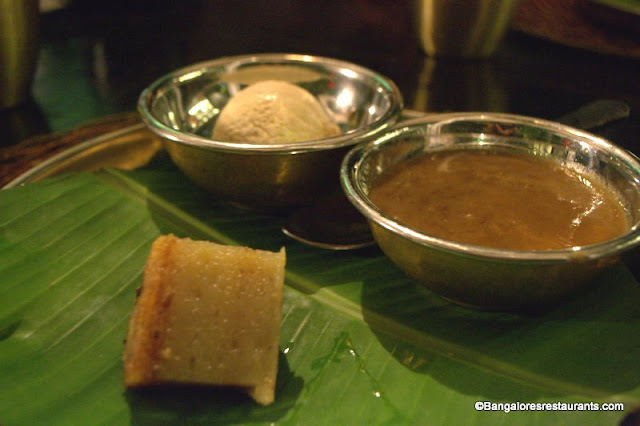 The meal ended with bebinca (a Goan staple in terms of dessert), the Ada Pradhaman, which my Kerala-bred husband gave two thumbs up to and a tamarind ice-cream that is to die for. 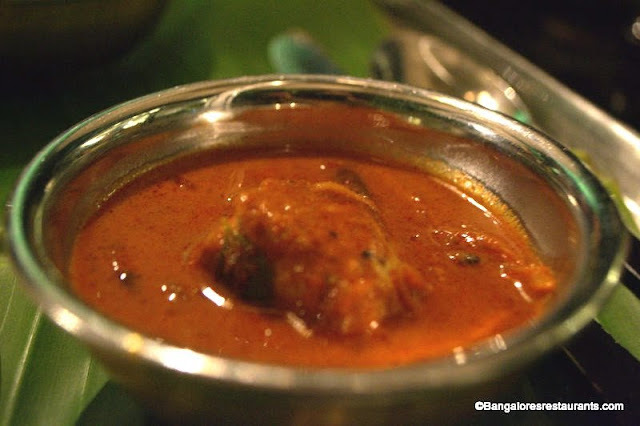 The meal was a spectacular one and the fact that I could choose masalas to go with my choice of fish allows for experimenting and some great flavors. The service is spot on and Chef Naren is always a pleasure to interact with. 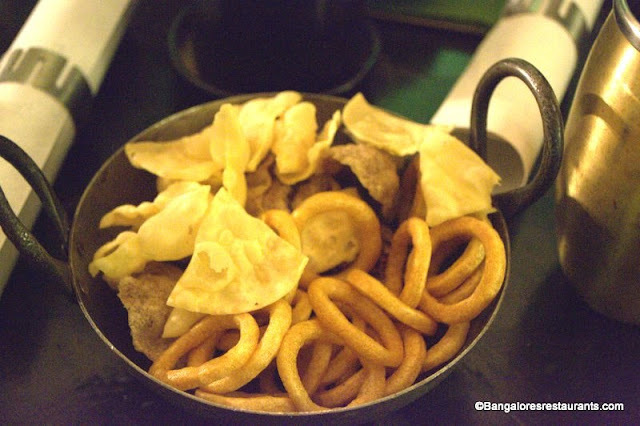 The lunch menu will have a limited number of dishes without compromising on giving you a good choice to select from. The dinner menu is extensive with as many as 80 dishes being on offer. A beautiful way to spend your evenings, especially on chilly ones like we are experiencing right now.